The Harry Potter series has meant a lot to me because I got to learn about Hogwarts and how Harry's parents died and how Harry is a hero. The Harry Potter series has changed my life because it helped me to realise that adventure is everything. In the finale Harry dies but comes back to life. 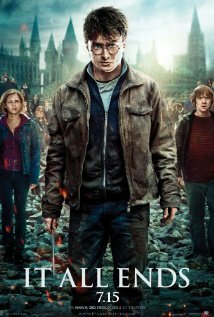 He, Hermione and Ron destroy all Voldemorts Horcruxes and Harry ends up killing Voldemort for good. How does Harry Potter come back to life in 'The Deathly Hallows'? Harry Potter never came back to life because he never truly died. Harry was in a sort of limbo area where he was given the choice to go back and finish Voldemort or to die. Harry was given this choice because Voldemort accidentally made Harry a Horcrux when he cast the killing curse at him when he was a baby. When Harry gave himself over to Voldemort with he intention of dying Voldemort killed the part of Harry inside of him. When Voldemort took Harry's blood to get his body back he created a rope between life and death. This selfish act, along with being a Horcrux and owning all three Hallows, allowed Harry to return and fight. Okay, I've read the books three times so far (plan to read them at least 20 times before I die) but you just totally RUINED the ending for everyone who hasn't read the last book yet. Please DO NOT be offended, I'm not trying to fight. But just think of the children... (just kidding) Seriously, though... have you ever been reading such an amazing book and you look it up and all these people are like ohhhhhhhhhhhh I'm just so sad that mr. Blah-dee-blah died because his wife Jamookashay wanted to be with his best friend Yoda. And you're just sitting there like T.T NOOOO!